This week is the third and final installment of covers from Collier’s African/American Library series. What we’ve got left are the books by African-Americans, and unlike the African novels, most are not contemporary, but “classics” from the Harlem Renaissance or older. 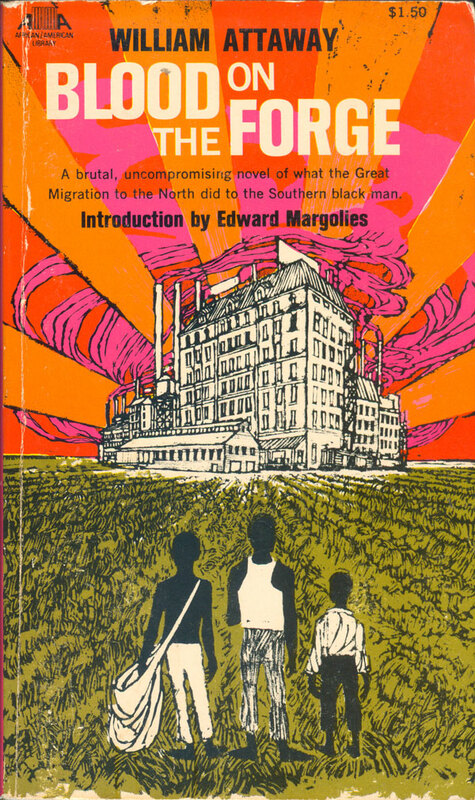 Case in point is William Attaway’s Blood on the Forge, a book about the Great Migration North, originally published in 1941. The cover does a good job bringing the book up to date with 1970, with it’s proto-post modernism. 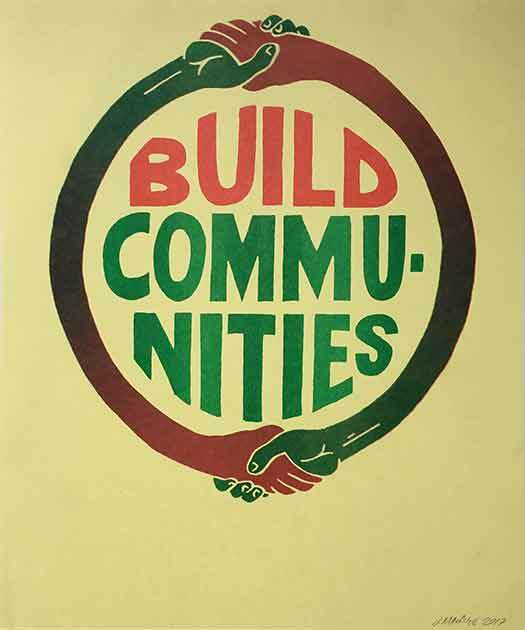 The orange and pink deification lines around the factory in the background simultaneously reference psychedelia and Emory Douglas’ illustrations for the Black Panther paper, while the rough-hewn block-printed figures in the foreground evoke Robert Gwathmey with a touch of Jacob Lawrence. While both aspects seem dated today, I suspect at the time the factory projected a modern feel, while the figures and field were rooted in the past. 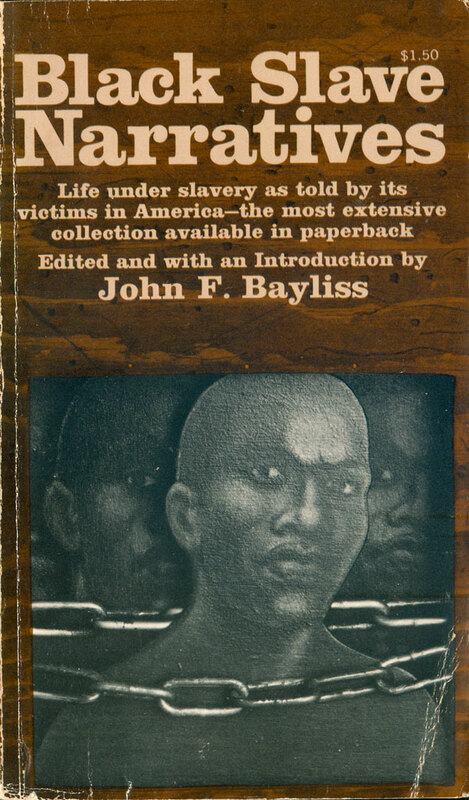 John F. Bayliss’ edited collection of slave narratives has a fairly uneventful cover, but there are a couple curious things about it. For one, the central figure is repeated in the background, once to the left, and once to the right. On the one hand this create the sense of slavery being social, and evokes the plural of the “narratives,” yet at the same time implies not just a commonality between the texts enclosed, but an actual repetition. This may just be laziness on the part of the illustrator (who is unattributed), or an interesting commentary on the nature of either slavery or the kind of writing that came out of it and attempted to articulate the experience. In addition, although less important, the designer choose to backdrop the entire cover with a strange painted wood grain pattern. I’m at a bit of a loss as to what that is intended to provoke. 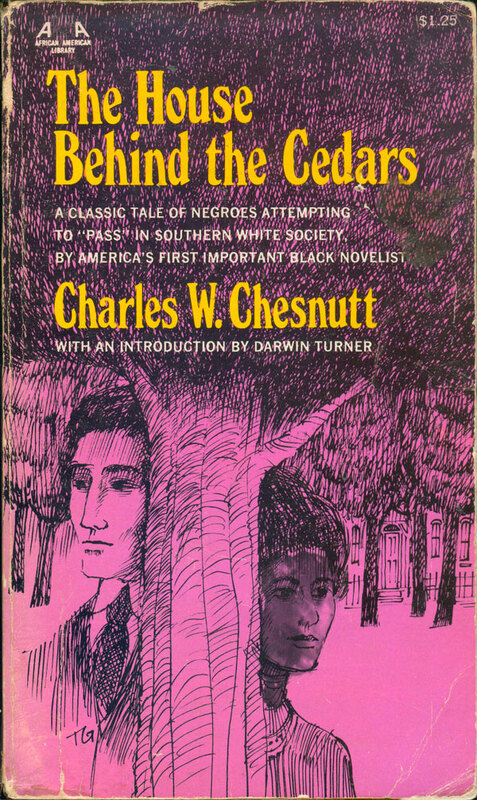 The House Behind the Cedars is a post-Civil War novel, originally published in 1905. 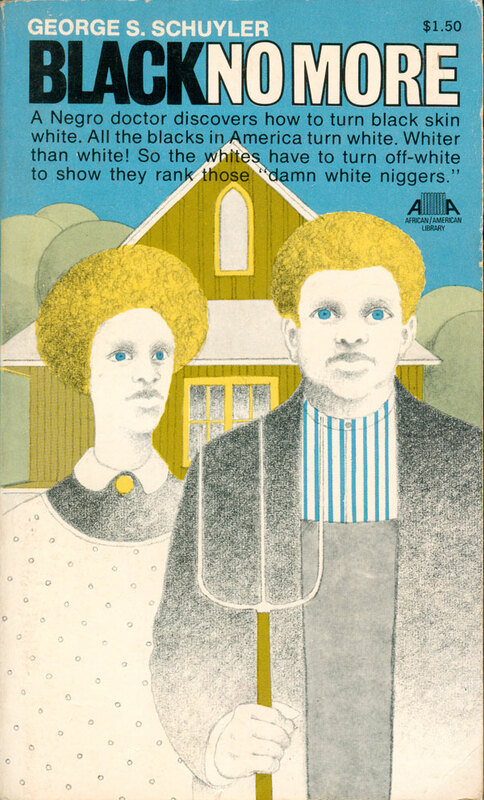 Pink and yellow seem like bold choices for a cover about interracial conflicts in the South, but the illustration is so staid, and seems so dated, that overall the book has a relative conservative feel. I do like how the foliage of the trees are constructed of simple tight scribbles, and that makes an effective backdrop for the title. Because of this simple element, the integration between image and type is much more effective than on many of the Af/Am books. Paul Laurence Dunbar’s The Sport of the Gods is from a similar period, 1902, but was a much better received novel, and the cover Collier put on it is much more dynamic. A striking blue and brown tight-cropped portrait confronts us, an arrogance implied by the toothpick in the mouth and a gold tooth, but the face is largely impenetrable because of a giant pair of sunglasses reflecting black rural and urban life back at us. The painting/illustration appears to be by E. Stephen Perry, and is really compelling, as it both repels and attracts. 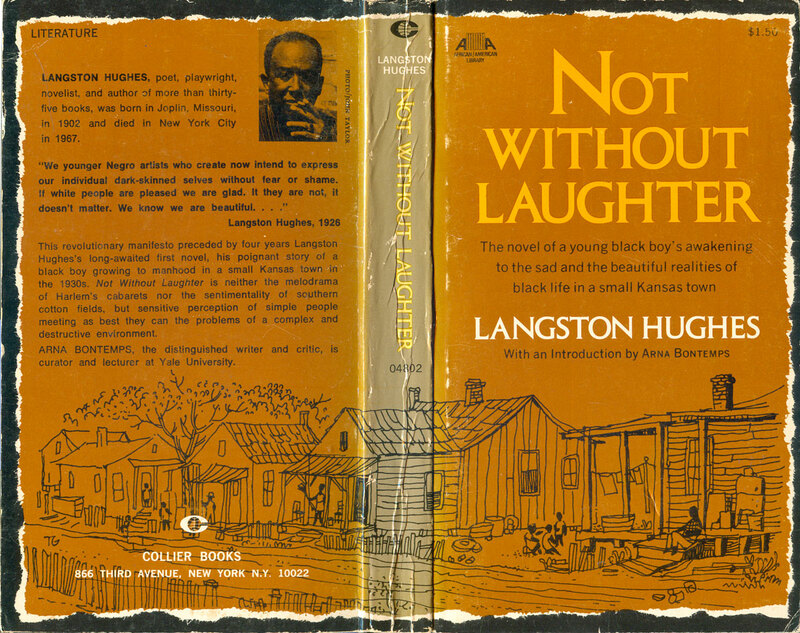 The cover of Langston Hughes’ Not Without Laughter reads as more conservative than many of the others. A flat back background lays torn around the edges, framed in black. A quick illustration of rural poverty sits at the bottom, quiet but evocative. The majority of the cover is dominated by the title and author name, obviously seen as the major selling points for the book. The illustration is simple yet strong, and it is a nice touch to have it wrap around the spine and onto the back cover. 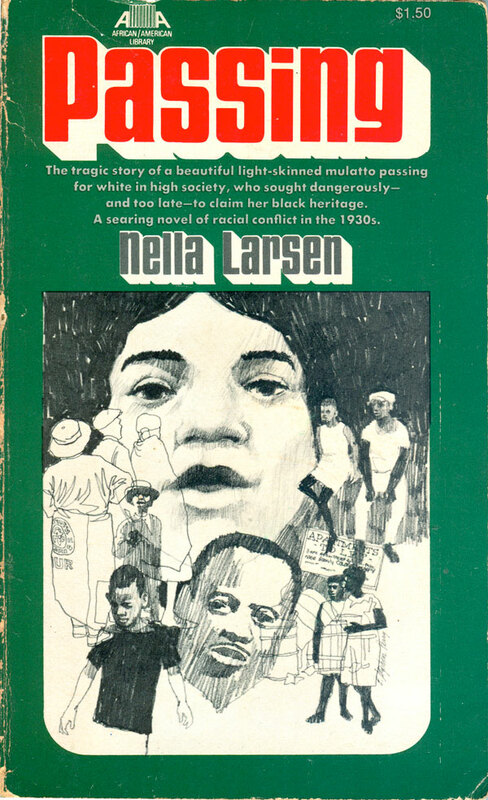 Nella Larsen was a bi-racial author of the Harlem Renaissance, who wrote two novels, Quicksand and Passing. Although she was not recognized during her lifetime, both books have been since republished in multiple editions and lauded as important articulations of the racial complexities and complications of the 1930s. Both books were reprinted in the Af/Am Library in 1971, and both feature the same basic design with illustrations by E. Stephen Perry. The consistency of the design is nice, and the drop shadow on the titles makes them seem almost up-to-date and somewhat timeless. 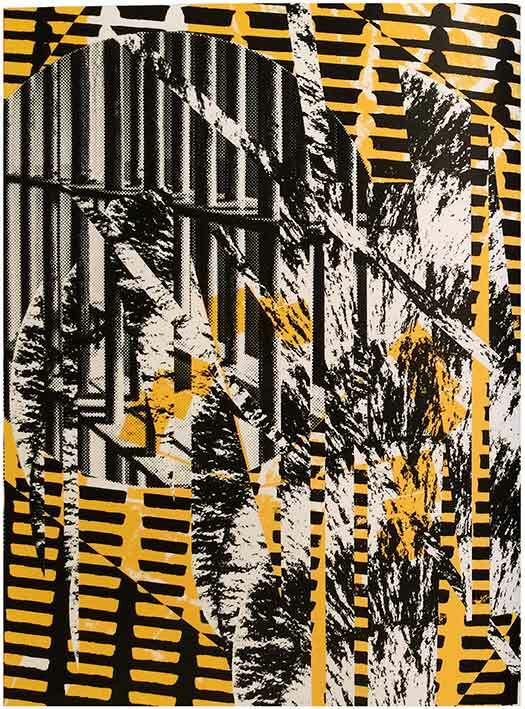 The cover of Melvin Kelley’s dem reads as a 70s black reinterpretation of cubism, filtered through the Harlem Renaissance. The image is by Leo and Diane Dillon, the book cover super-couple. The must have designed thousands of covers from the 60s through the 80s (and even into the 90s), the vast majority for science fiction paperbacks. But here you can see some of their influences, with a dash of Jacob Lawrence and early Faith Ringgold. 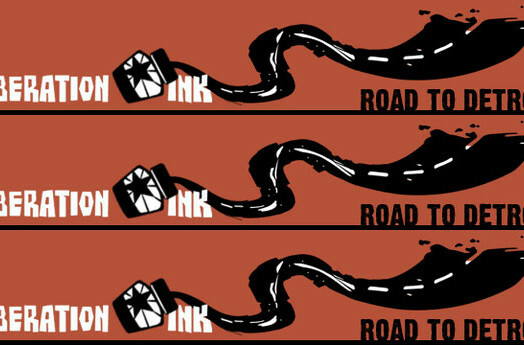 The image is also reminiscent of the Corky McCoy’s illustrations for Miles Davis’ 1970s On the Corner/Water Babies period. 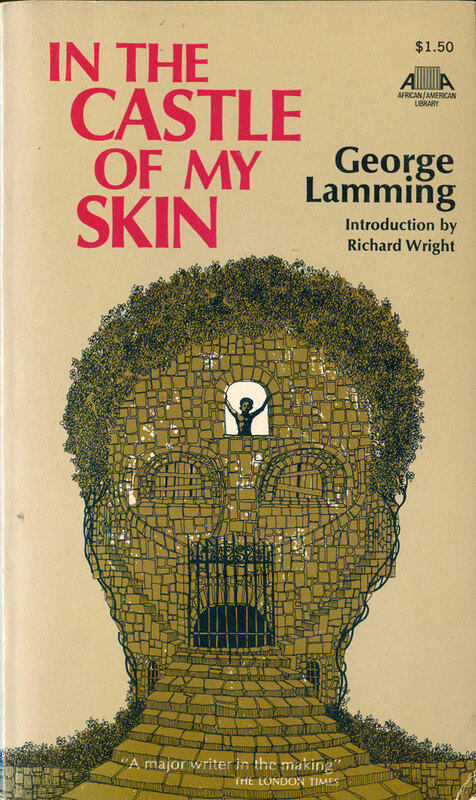 George Lamming’s In the Castle of My Skin cover is similar to that of Legson Kayira’s The Looming Shadow, which I looked at two weeks ago (HERE). A central face/head morphs into other shapes and objects the more you look. The face is a castle, a figure trapped within, windows become eyes, and the gate a mouth. 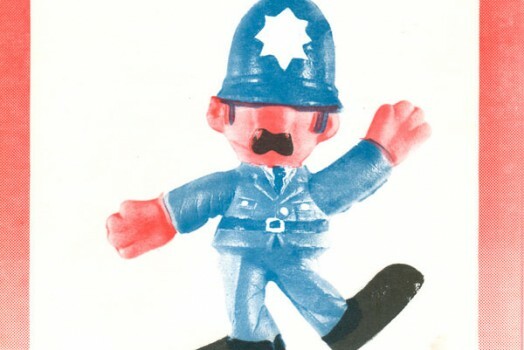 It’s a creepy image, but would have been better off larger, and without the awkward pink type. 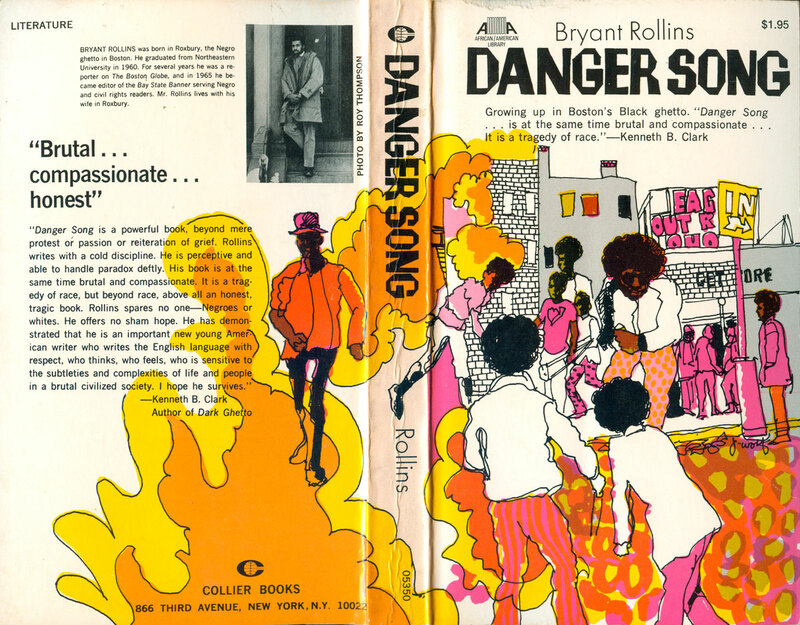 Bryant Rollin’s Danger Song images a different 1970s, one of bell-bottoms and disco. Big afros, orange and pink patterns, and happy trees and store signs mingle here, evoking a happening street life slightly off-kilter. Shocking blue eyes look out from the cover of George Schuyler’s Black No More. A couple repeats the motif of American Gothic, but they are black this time around, but not simply black, black and albino. This twist is a bit shocking, and definitely catches attention, as I assume the novel did in 1931. 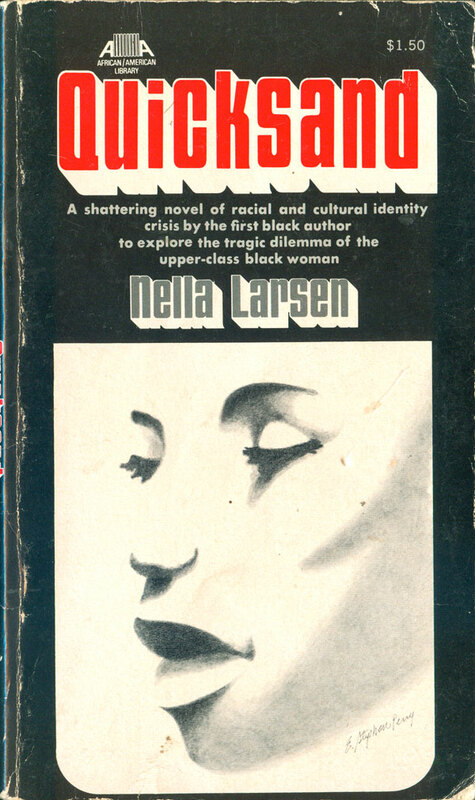 The basic plot is imaged by the cover, a future world where a black doctor discovers a way to turn black skin white, and all that ensues from that conceit. The style of the image dates it, with the round trees in the background paralleling the afros but also evoking a neo-psychedelic art deco vibe. 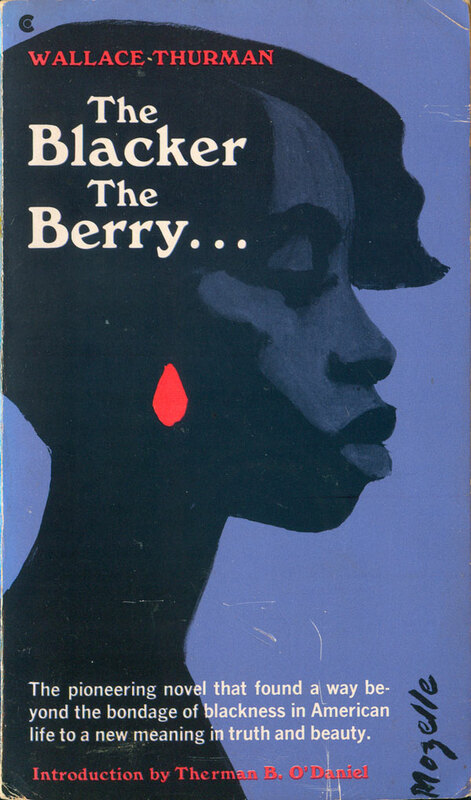 Wallace Thurman’s The Blacker the Berry… also integrates the illustration well into the overall cover. There is too much text (per usual for so many covers) but it mostly stays out of the way, letting the strong silhouette carry the design. The red oval glows on the side of the face, playing earring, berry, and blood spot. 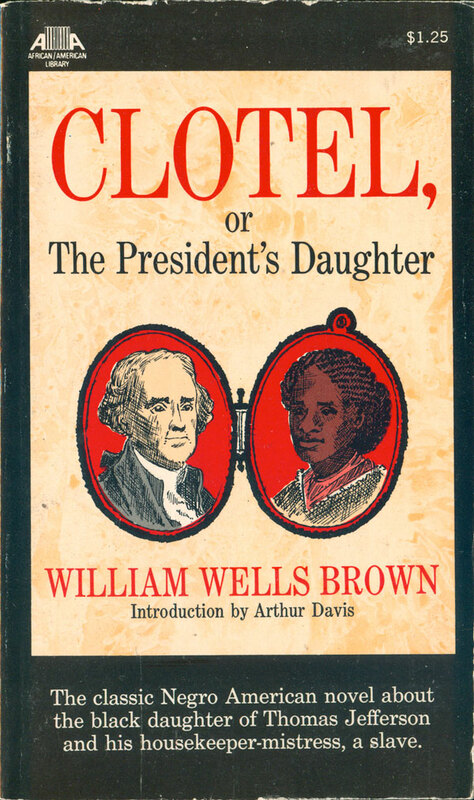 William Wells Brown’s Clotel, or The President’s Daughter is one of the more “classic” of the covers here. 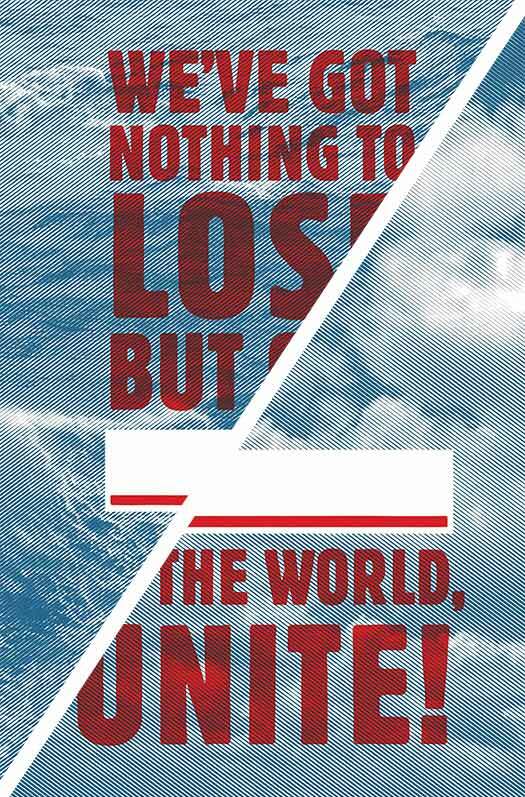 Crisp serif-ed type in both red and black, all capitals and lowercase, and multiple sizes creates the aura of an old-school letter-pressed broadside. The clean illustration of two-faced locket all carries with it a Victorian feel. These visual devices work on multiple levels, both conveying the actual age of the novel—originally published in 1853—and jarring the viewer by framing Thomas Jefferson having a Black daughter with the trappings of tradition. 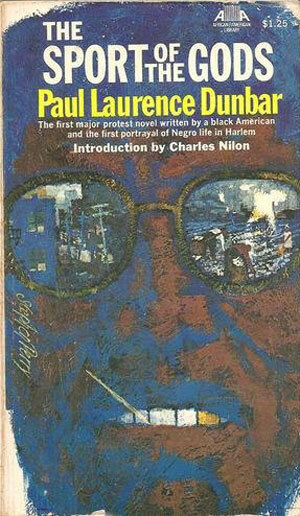 I’ll close out with covers for Melvin Tolson’s two novels, Harlem Gallery and Libretto for the Republic of Liberia. 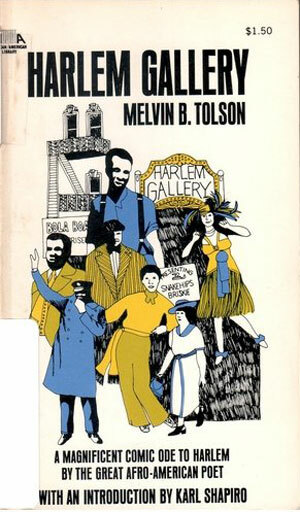 Harlem Gallery’s cover is a raucous compilation of illustrated figures—cops and flappers, workers and bosses. 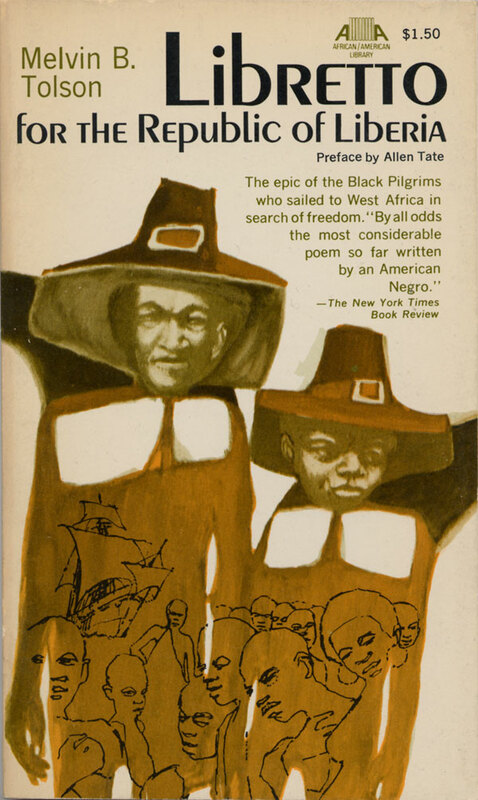 The Libretto cover is witty, re-imagining the black American immigrants to Liberia as pilgrims. At the same time a line drawing within the figures evokes slavery, confusing and complicating the image. Overall the color could be stronger and more distinct, and would have helped the pilgrim deceit work better. 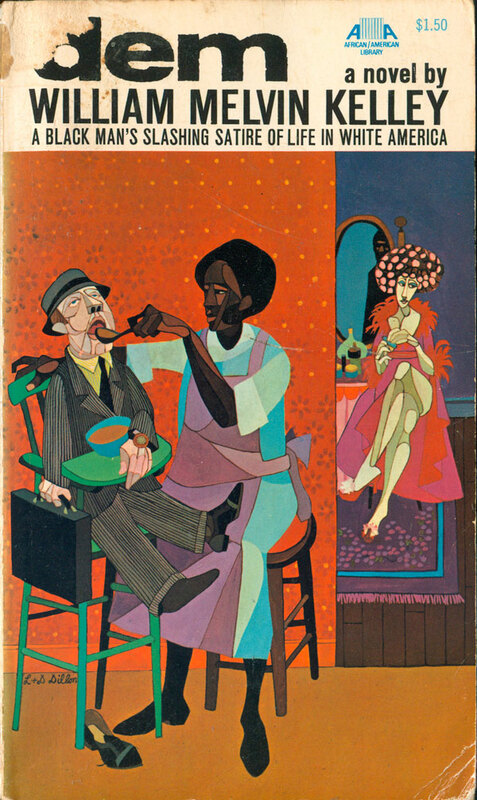 The ‘dem’ cover is by Leo and Diane Dillon, black artists who are primarily known for their sci-fi (speculative fiction/new wave era) covers. 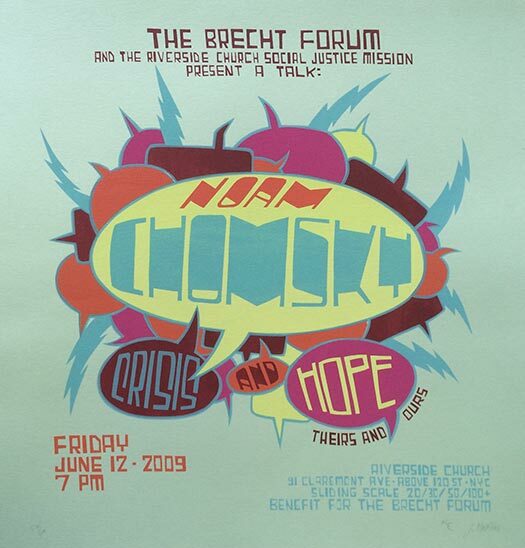 Leo died just this year and I keep meaning to a blog post about their work, as it’s excellent.